As Zimbabweans waved goodbye to 2018 yesterday, and awaited with much trepidation the dawn of the new year, in the light of the country's deepening economic woes, the Daily News - as per its rich annual tradition - rated President Emmerson Mnangagwa and his Cabinet ministers' performances for last year. The resultant report card, as our readers might imagine, does not make for happy reading - amid a feeling of regrets and lost opportunities among many Zimbabweans, given the expectations and euphoria that accompanied the widely-supported military coup of November 2017, which ousted the detested former president Robert Mugabe from power. To say 2018 was a tough year is to understate the enormity of the challenges Zimbabweans had to live through during the year. Indeed, it was the proverbial "annus horribilis" economically - a Latin phrase that means a horrible year. Yet, and as alluded to above, Mnangagwa had swept to power amid much hope among the generality of the country's citizens - who had endured nearly four decades of hell under Mugabe's ruinous rule. But the task facing the 76-year-old Zanu-PF leader, of rebuilding Zimbabwe's shattered economy and lifting the quality of life of its long suffering people, has so far proven to be a tad too onerous for him and his misfiring Cabinet team. Things took a turn for the worse following the country's historic July 30 national polls, where Mnangagwa narrowly defeated opposition leader Nelson Chamisa in the hotly-disputed presidential plebiscite. Until then, Mnangagwa had been credited with presiding over arguably the most peaceful elections in the history of the country as he, together with Chamisa, preached peace and tolerance during their campaigns. However, the peace and camaraderie spirit that had been displayed in the run-up to the polls were marred by deadly violence which broke out in Harare's central business district (CBD) on August 1, when the army used live ammunition to quell ugly protests. Political analysts said the subsequent deaths and witch-hunt against opposition leaders - including the hounding of MDC kingpin Tendai Biti out of the country before he was caught and brought back in a humiliating fashion - had harmed Mnangagwa's quest to mend once frosty relations with Western powers. This and Mnangagwa's continuing political brawling with Chamisa, who vigorously contested the outcome of the July 30 polls, has also cast a dark shadow on the president's plans to lift Zimbabwe's fortunes. After the Constitutional Court (ConCourt) affirmed Mnangagwa's poll victory, he briefly lifted the nation's mood with his Cabinet choices - which saw him dumping most of the old guard which had become synonymous with Mugabe's previous governments. The "poster boy" of his Cabinet team was former banker and founder of the now defunct Barbican Bank, Mthuli Ncube - who was appointed Finance minister, replacing the hardworking Patrick Chinamasa who was shunted to Zanu-PF's headquarters. But even this "trick" has failed to yield the desired national goals. The country's sickly economy continues to worsen, amid ominous signs that the socio-economic horrors of 2008 can once again be experienced soon. Below are the Daily News' reviews and gradings of the Cabinet's performance since it took office in September 2018. The veteran Zanu-PF leader's reign to date can only be best described as a roller-coaster ride. This is despite the fact that upon replacing Mugabe, Mnangagwa was feted like a king, with many Zimbabweans hopeful at the time that he would turn around the country's economic fortunes. Sadly, that initial goodwill that he enjoyed has now almost wholly disappeared. His government's underwhelming record of efficacy and delivery - despite the significant energy and endeavour that he has shown - is now beginning to make the disliked Mugabe and his useless minions look like they were saints! For a start, the economy is now much worse than when the nonagenarian departed high office. The prices of basic goods have shot through the roof, and many commodities like cooking oil and fuel are in short supply. And the rampant public sector corruption that characterised life under Mugabe has now got wings under Mnangagwa. Mnangagwa himself admitted recently that corruption had seriously permeated through his Cabinet and other critical arms of government. He even revealed, stunningly, that one of his Cabinet ministers had asked for a R5 million bribe from an unnamed investor. What appears to have particularly worked against Mnangagwa thus far is his silence when things in the country have gone horribly wrong. 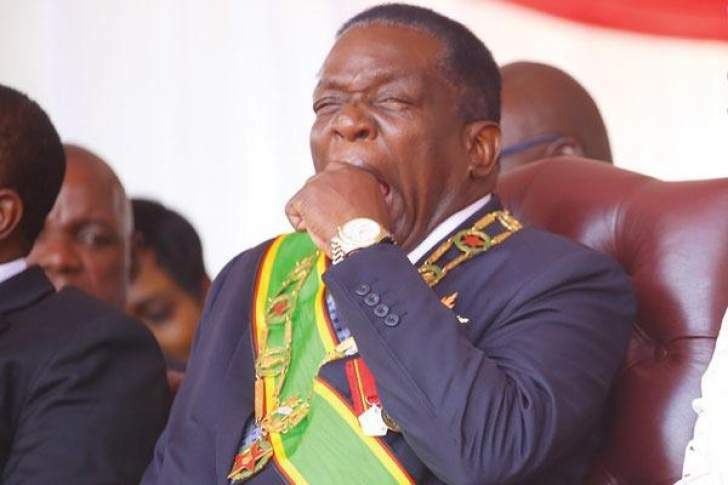 The mayhem that followed the controversial economic measures that were announced by Ncube in October warranted Mnangagwa's urgent action - but he mostly remained mum for weeks on end. As a result, foreign currency became even more scarce in the country, goods disappeared from supermarket shelves and prices went haywire - leading ordinary people to ask where the president was. This was in contrast to Mugabe, who for all his uselessness, never missed an opportunity to publicly intervene in matters when things went wrong. In this regard, and notwithstanding Mnangagwa's quiet disposition, his advisors would do well to encourage him to improve his communication skills and strategy. But the Zanu-PF leader did make a few commendable moves during the year, including operationalising the National Healing and Reconciliation Commission - hopefully as the first step towards tackling previous atrocities such as the emotive Gukurahundi massacres of the early 1980s. He also had useful engagements with multilateral institutions, as well as moving energetically to repair years of broken ties with Western countries. Under his watch, Zimbabwe has also improved somewhat the ease of doing business in the country, although this is still far from being idle enough to attract meaningful investment to the country. Mnangagwa has also now initiated work on much-needed media reforms, although - again - there has been very slow progress towards truly opening up the media space, especially in the broadcasting sector where only Zanu-PF-aligned companies have benefited from licences. So, while the president scores well on effort, he falls flat when it comes to implementation. Indeed, he promised to do so much, but has so far delivered very little. The former Commander of the Defence Forces (CDF) - although he seemingly means well - regularly found himself in no man's land during the year, as he appeared to try too hard to make himself relevant as a politician and as a government enforcer. To this extent, he too often used his military skills to deal with situations which required diplomacy - cases in point being his handling of the nurses' strike and the industrial action by medical doctors. However, he did endear himself to both Zanu-PF followers and ordinary Zimbabweans in October, when he pressured Ncube to revise his unpopular two cents per dollar transactional tax. The hope is that Chiwenga's many mistakes were a result of him still finding his way in politics - and that he will improve with time and experience. The reclusive VP, plagued by family issues and ill-health, was a massive disappointment. It's not an exaggeration to say that many Zimbabweans struggle to even recognise him. While not as hopeless as one pathetic Phelekezela Mphoko was, he has major work to do if he is to improve his standing and ratings in future. To his defence, his health woes were exacerbated by the injuries which he suffered in the cowardly Bulawayo bombing in June, which killed one of his bodyguards. As pointed to above, Ncube was undoubtedly the poster boy of Mnangagwa's Cabinet in September. He came with a big reputation following his stints in South Africa, at the African Development Bank and at Oxford University. But he flattered to deceive, in addition to coming with baggage emanating from the spectacular demise of his Barbican Bank empire. When Ncube was given this key post, he told the media that he was going to prioritise currency reforms - which would see bond notes being scrapped by the end of December 2018. Let's quote him verbatim to illustrate the point. "I am very clear that there have to be currency reforms and the current currency approach is not working. "In doing so, there are three choices that I will explore and pursue with urgency: One, adopt the US dollar only and remove the bond notes from circulation through a demonetisation process and also liberate the exchange controls. "Three, adopt a new Zim dollar, and here one needs to be clear that it has to be backed by adequate foreign reserves and macro-economic conditions for its stability. Foreign currency accounts will also be introduced. "For sure, currency reforms will be implemented. I would like to implement this by year-end," Ncube said only in September. Alas, Ncube had done very little along these promising lines by yesterday. The policy measures that he did take caused total mayhem in the economy, with prices of goods shooting up, fuel disappearing from garages and parallel foreign currency rates hitting the roof. Ncube's unpopular economic stabilisation measures included the much-criticised two cents tax per dollar transacted. While the minister has tried very hard to justify his new economic measures, the hard facts on the ground paint a very different picture, with the country's official inflation now at its highest in a decade. Indeed, so many things have gone wrong for Ncube in the short four months that he has been in government. His losing cause was certainly not helped by his ill-advised decision to hire well-known rouble-rousing influence peddler, William Gerald Mutumanje - also known as Acie Lumumba - as his spokesman, who made staggering and unsubstantiated Facebook claims against four RBZ executives and oil mogul Kudakwashe Tagwirei. By the time he cut loose Lumumba, who later confessed to have been paid US$40 000 cash to smear the four RBZ officials, Ncube had caused extensive damage to the banking sector. Unsurprisingly, the RBZ executives who had been suspended to pave way for investigations, have been cleared by the authorities. The minister's appointment, which stirred significant controversy as questions were raised about his qualifications as a medical doctor, was truly thrown into the deep end when he had to immediately deal with a deadly cholera outbreak soon after he took over from David Parirenyatwa. While he was lucky in that the government received overwhelming support from the corporate world and development partners, who poured millions of dollars to contain the deadly disease, it still took many lives. Further tests for him came when retail pharmacies started charging drugs in foreign currency, while nurses and doctors also went on strike. To his discredit, Moyo resorted to threatening pharmacies with the withdrawal of their licences, instead of addressing the well-known core problems of foreign currency shortages and cartels that enjoy a monopoly in importing medicines into the country. On that score too, the former Chitungwiza Hospital chief executive has dismally failed to handle the doctors' strike - with the physicians accusing him of using "divisive" tactics in a bid to end the strike. The government's subsequent decision to fire 530 doctors, has also removed whatever hopes were there that Moyo could be relied upon to find a solution to the strike. And his ministry's latest decision to seek authorisation from the Medicines Control Authority of Zimbabwe (MCAZ) to extend the shelf life of anti-retroviral drugs which had long expired, just about sums up his short career in Cabinet. While commendable work has continued under Matiza in the rehabilitation of the country's damaged roads infrastructure, many problems still obtain within this portfolio. Like his predecessors Nicholas Goche, Joram Gumbo and Obert Mpofu, he has dismally failed to deal decisively with corruption at the Zimbabwe National Roads Administration (Zinara), and to sort out the mess at Air Zimbabwe - and the dodgy Zim Airways deals - once and for all. The amiable minister Nzenza appears to have made some strides in stamping her foot down at the National Social Security Authority (Nssa), which had for long been tainted by serious allegations of corruption and mismanagement. Most welcome too, Nssa has improved its communications and relationships with the media and the general public. Under her watch, ghost workers and graduates of the notorious youth service known as the Green Bombers have also commendably been cut loose. However, and following Ncube's dubious decision to introduce a raft of controversial policies - including the unpopular two cents tax - Nzenza now has to deal with looming labour unions unrest, which will test her to no end. For all the negative stereotypes that are flung his way, Shiri is fit for purpose, as he is a dyed-in-the-wool farmer. In addition, he has shown that he is one of Mnangagwa's hardest working ministers, even as he tends to operate quietly. Officials in his office say since he was appointed to his position, the former Airforce of Zimbabwe boss has been to every corner of Zimbabwe, auditing the state of agriculture and farms in the country. He has also - refreshingly - not made it a secret that most resettled farmers have failed the government in its bid to get them to work their lands optimally. Thus, and while Zimbabwe faces a difficult agricultural season ahead, largely to natural causes, Shiri's blueprint and energy raise hopes. While one Jonathan Moyo was not the Daily News' favourite personality while he was in government and led this ministry, he was not only visible, but also tried to introduce many innovations. On his part, Murwira has done very little, apart from reversing his Moyo's laudable STEM programme - on the basis that was rampant abuse of resources in the programme. Just last week, Murwira was part of the group which misled the nation when it claimed that striking doctors had not yet qualified as certified professionals. While he has lacked the energy of some of his predecessors, the one good thing that Moyo has done has been to let MDC councils run their affairs without interference. However, Moyo has his work cut out in other key areas. For example, Zimbabwe has a long list of people on the housing waiting list - and so far the new Zanu-PF government has not rolled out any meaningful programmes to fulfil its electoral pledges. Ahead of the July 30 elections, the ruling party had promised to build 1,5 million medium-income housing units over a five year period to 2023. This translates to at least 822 houses a day in a year, over 365 days - and for now this remains a yawning pipedream. The nation is also still looking forward to the devolution of power to provinces which Moyo is supposed to spearhead. This is another minister who is failing dismally to make a mark. The Registrar General's Office is still experiencing serious problems in processing passports and bribe-seeking police have returned to the roads, with security roadblocks in every town. In the meantime, police continue to struggle to deal with crime generally, as evidenced by the poor prosecution of fraud and corruption cases brought before the courts. One of the reasons that has been proffered for this is that dockets are poorly prepared due to a glaring lack of skills and grasp of the issues being investigated. And police also continue to battle to understand the meaning of the Constitutional Court's ruling which outlawed Section 27 of Posa, which allowed demonstrations. Ziyambi's biggest issue has been the government's lack of real political will to align the country's laws with the Constitution. While Gumbo often tried his best, the way he communicates regularly exposes him badly. He has also failed completely to get a proper handle on the fuel crisis. He also needs to be told that Zimbabwe has no foreign currency to pay for fuel and that these shortages have nothing to do with an allegedly expanding local economy. The much-loved "General Bae" did well to market Zimbabwe well, as he became the fulcrum of Mnangagwa's re-engagement drive with Western countries. Sadly, he was soon struck down by ill-health, which has curtailed his good work. Still, he remains one of the most promising ministers of Mnangagwa's government. This is always a tough ministry to superintendent in Zimbabwe, even at the best of times. One thing she has done well is to avoid becoming the story, as many of her predecessors did to their discredit. In addition, she takes a sober approach to work, as exemplified by her reaching out to all media houses when she assumed her position. Going forward, all eyes will be on her to see how the much-talked about new radio and television licenses will be awarded under her watch - a national task which all her predecessors failed dismally. We could not rate the rest of the ministers because of space constraints.